LEEDS, England, Sept. 13, 2018 /PRNewswire/ -- Language services provider thebigword has teamed up with Google to help small and medium-sized enterprises (SMEs) break down language barriers and find new international customers for their goods and services. 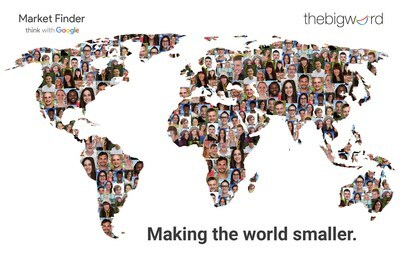 The search engine giant chose thebigword as a localisation partner for its new Market Finder tool. 1. Market Finder helps SMEs create a global business plan using detailed insights into how potential customers use the internet and their disposable income to recommend the best markets. 2. Once SMEs have chosen a new location to target, Market Finder offers tools, guides and resources to help plan the next steps including localisation, international payments and logistics. 3. Market Finder helps SMEs make marketing decisions with data and customer insights to understand the best language for advertising and the best ways to reach their potential customers. The service offers full access to 180 markets and uses in-depth insights from 32 data sources. In one example, a travel metasearch engine which allows users to compare the price and journey time of air, rail and bus travel options in a single search used Market Finder guides and insights to localize its websites for European markets. Larry Gould, founder and chief executive of thebigword, said: "For many small and medium-sized businesses, exporting for the first time can seem like an intimidating prospect. "But it really is as easy as 1-2-3 with Google Market Finder, which demystifies the process of selling goods and services overseas. "Great Britain has a proud history as a great trading nation and this tool can help the next generation of British exporters connect with new customers, wherever they are in the world. "In 2016, we exported goods and services worth more than $400bn, including cars, medicines and gas turbines, making us the 10th largest export economy in the world. "There is so much opportunity, particularly for small businesses, and I encourage them to be brave and go global." Marco Giorgini, Google Product Marketing Manager, said: "The internet has broken down international trading barriers to bring potential customers to your door at lower risk and lower cost than ever before. Market Finder makes it easier still." Greg Hands, minister of state for trade policy, said: "Today, 3.7 billion people are online around the globe, so every business, no matter how small, should be going digital to reach new customers around the world." It works with many of the world's biggest and best-known brands and a growing number of large US and UK government organisations.